Delivering a great customer experience includes making your customers feel secure. Organizations that fail to provide a secure system for IVR payments within their contact center expose themselves, their employees, and their customers to significant risk of theft and considerable fines. One area most vulnerable to security breach is call recording. Calls are recorded for a variety of reasons, including verifying information or agent training. Capturing payment card details without a PCI compliant self-service IVR may leave you and your customers open to a significant security breach. Learn how to record calls without capturing sensitive customer data. 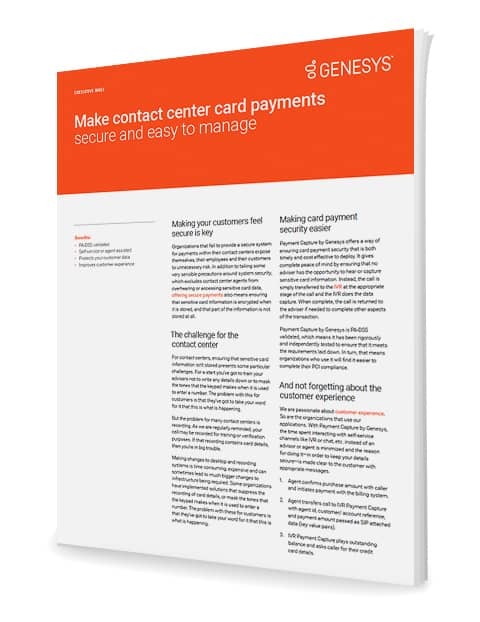 Download this executive brief to learn how to incorporate card payment security into your IVR that is both timely, cost effective to deploy and protects you and your customers.